It keeps your branding and marketing consistent across all print and online media. When you have a reference point for your marketing pieces, you can create them more quickly and efficiently. When all of your marketing materials are consistent and on-brand, it shows people you know what you’re doing. When everything is in one place, it helps your partners and vendors (such as graphic designers, photographers, writers and print vendors) do their job faster and easier—which also saves you money. When brand details are easily accessible, it helps to avoid costly mistakes such as using the wrong color or font on a printed piece. When everything is in one place, necessary brand assets such as logos or brand colors, can be easily accessed when needed and project delays can be avoided. New employees can get to know your brand quickly and easily, so they can get to work faster. It also provides them a constant reference as they get acquainted with their new job. 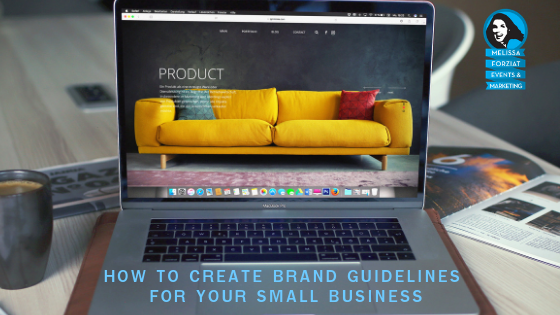 A good set of brand guidelines will assure everything people see and experience related to your small business is an accurate expression of your brand. Before getting started, think about how your organization will use the guidelines. Include verbiage about how they relate to your overall brand. Include sizing requirements, clear space (the space around the logo that separates it from other design elements), logotypes and icons, logo lockups (i.e. if the logo should always appear with another element such as a tagline, date or URL). It’s also a good to include misuse examples, for example: the logo should not be stretched disproportionately or used smaller than ¼”. Include when and how to use the tagline, and where it should be placed in relation to the logo. Include allowable primary and secondary fonts for both print and online usage. Optionally, include examples and/or suggested usage for headlines and body copy. Include primary and secondary color palettes for print (Pantone, CMYK) and digital (RGB, HEX) usage. Include suggested types of photography and illustration that should be used, as well as when images should be used. May also include recommended website for purchasing stock photography or illustration and/or image guidelines for in-house or contracted photographers. Include writing guidelines for print marketing, as well as digital marketing such as blogs and social media outlets. Including guidelines for writers who will contribute articles to the organization’s website, blog or social media. Include organization blurbs (ranging from a 5-word blurb to several paragraphs), staff bios, headshots, and other materials that may be needed for PR opportunities. Include filenames and shared drive locations for easy access by all staff members and contractors. You’ve invested money in and worked hard to develop your small business brand. Having a solid set of brand guidelines will make sure everyone sees your brand for what it truly is. Lidia Varesco Racoma of Lidia Varesco Design in Chicago helps organizations and entrepreneurs share their message through branding and marketing design. Follow her on Facebook or Twitter for quick branding and marketing tips.